On the Brink is a compelling collection of short essays that chronicle a fact-finding and solidarity visit the author made to the West Bank and Israel during the last three weeks of June 2014. Physician, author, filmmaker, and longtime activist Alice Rothchild uses her powers of careful observation and her deep understanding of the consequences of racism and occupation to craft a lively, honest, heart breaking collection of reports from the field. On the Brink documents stories and lives that seldom make the evening news, but that are essential to understanding the context in which that news occurs. 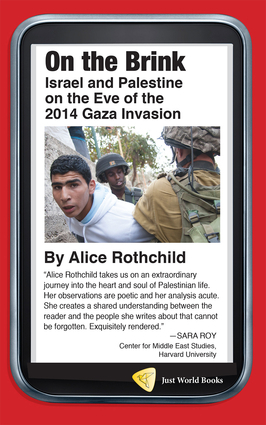 Alice Rothchild is a Boston-based physician, author, activist, and filmmaker. She has written and lectured extensively on many topics including the health and human rights effects of the Israeli occupation. Her previous work includes the book Broken Promises, Broken Dreams: Stories of Jewish and Palestinian Trauma and Resilience (Pluto Press 2007) and the documentary film, Voices Across the Divide (2013).